The 1970’s Tom T Hall song Old Dogs, Children and Watermelon Wine runs through my head frequently lately. I expect that’s because our Golden Retriever, Divot turned 13 yesterday, an amazing feat for her breed. She is very healthy and active but her age has most recently declared itself. The vet has warned us her cataracts continue to cloud her vision. She doesnt always see her hand signals for Sit Speak Down Side. Her formerly fine-tuned hair-trigger hearing has faded gradually these past six months, resulting in more instances where she’s startled when we walk into a room. A few months ago, she started having what looked like petit mals (mini epileptic seizures). She shuddered for no apparent reason, for less than a second. She was having six or more each day. After two weeks of adding coconut oil to her food the seizures are almost gone. But it’s a reminder that she’s not immortal. She has started having difficulty getting up from lying down on our slippery laminated floors so we bought six cheap ugly mats to put in all her places on the floor. It seems to help. The vet recommended glucosamine. Not sure if it helps but it can’t hurt. Where she used to bound into and out of vehicles she’s now unsure about exiting and often waits for a boost into the truck. Our walks deteriorate to mere strolls. My attempts to hurry her are often met with stubborn resistance that makes me smile rather than annoys me. I respect her right to be a bit crotchety. She has paid her dues. She deserves to have her own way here and there. Some days she moves along at a nice clip. Divot’s naps grow longer. She seems to sleep 23 hours a day. She has more trouble sleeping through the night, not atypical, I think considering her human-equivalent age of 91 years. Bladders seem to be among the first organs to lose functionality. Getting up in the night to let her out used to bug me but now I often have to get up myself so I can’t really grouse about her condition, can I? Sometimes she doesn’t need to go. She just wants to be outside taking in the wonder of the early early morning with its cool air and soft light. I don’t blame her. It is peaceful. Great wisdom in both lines. There is nothing so pure as a dog’s knack to love unconditionally. When I come home Divot acts as though I am the most important person in the world. She can’t get close enough, smile widely enough or “sing” loudly enough. It’s not just me. She treats every guest in our home with exuberant attention, leaving no doubt she’s thrilled to see them, even if they come everyday. Divot is a sure cure for feeling blue. It’s impossible not to laugh at her antics and marvel at her undying devotion to her pack. Divot is content to just be. She doesn’t need to do or have anything. She quite happily lies for hours at my feet or just outside my office door. If I go outside to putter in the garden, she’s out there with me. If I sit inside to read, she sleeps on the floor or on her leather loveseat. I find myself cherishing my time with Divot. She has no pain and still fools people with bursts of puppy-energy but in my heart I know she can’t live forever. I am tempted to begin grieving, at least preparing for the day I don’t have my hiking partner poking through the long grass and wildflowers with me at the bark park. But then I remind myself to enjoy the present. She could live another year or two. As long as she has no pain. I hope she dies in her sleep in her favorite dugout near the house foundation like my childhood family dog, Lassie did one warm summer day. Will you get another dog? I wave off the well-meaning question. I am not going to borrow worry. I am going to be like an old dog and just be. And make everybody believe they are the most important person in the world. Thanks for teaching me the secret to your perpetual smile. 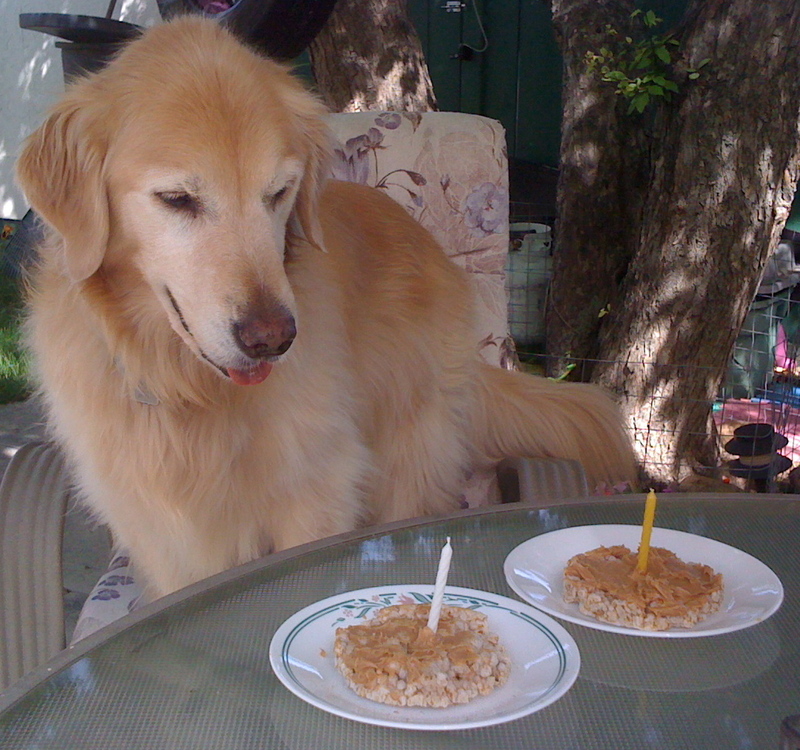 August 22: I dedicate this post to my mom’s dog Muffin, who gave Mom 14 years and seven months of joy. She passed on this week. read related article here: One dog owner’s feelings about her dog’s last days. The last few days the world has looked a little rosier to me. I notice I’m taking more time to marvel at natural wonders. Near death experiences tend to have that effect. Here is the story of how a skunk spraying my dog last week saved my life. It’s one of my silver lining stories. Hubby, Doug and I were on vacation last week and our daughter was babysitting our 13 year-old Golden Retriever, Divot. Two days after an emergency vet visit, Divot encountered a skunk. Despite numerous baths she still emits a faint “eau de skunk”. Our first day back Divot had a playdate with Betty, an elderly customer of Doug’s. Betty loves Divot. I had an hour of found time. What will I do? Read my book? Or weed my flower garden? Lazy Shelley voted for reading. Responsible Shelley opted for weeding. Responsible Shelley won by a hair. My, how the weeds have grown in just ten days! There is a big one there. Ouch! Something just stung my left calf. Oh! There are prickles up my right side! What is happening? Insect! Bees! Run! I dash for the front door, tear into the bathroom and tear off my shirt to survey the damage. One of the attackers is in here with me! I bolt for the kitchen, slamming the door behind me. Baking soda! I make a paste of baking soda and cold water and smear it on the stings on my side and in my armpit. Soothing. I feel light-headed. Something is happening. Where is my cell phone? I have to sit down. My phone in hand I head towards the couch. Divot and Doug walk in the front door. I sit down, relieved to see Doug. I know he will take care of me. My lips begin to tingle. While he dials I have the sudden urge to scratch myself. All over! It doesn’t help. I wake up on the floor. Doug is holding me, saving me from aspirating my own vomit. He is on speakerphone with 911. I obviously missed the pail. I am confused. When did that happen? They ask a lot of questions. I know the answers but some of my answers are too long. I don’t have the energy! Epi-pen in thigh. That hurts! We need to get your blood pressure up. That’s why you passed out. How is your breathing? Amazingly, I had all the symptoms of anaphylactic shock except the trouble breathing. After six hours in Emergency, they release me, a prescription for an Epi-Pen in hand and strict instructions to avoid bees for 72 hours. Seriously? They need to tell people that? So what does all this have to do with the dog being sprayed? When Divot got to Betty’s, Betty wasn’t feeling well and she was put off by Divot’s skunk smell so Doug decided to cut the visit short. If he hadn’t walked in the door when he did, I’m not sure I could have called 911 for myself. I could have choked on my own vomit. Without immediate attention, I could have experienced cardiac arrest or had severe breathing issues. So the way I see it, I’m alive because a skunk sprayed my dog.